Actual maximum bonus damage is capped at 100, although the counter in the item's description will continue to increment for each undead killed, even past 100. You can easily raise your kill count to 90 by raising your own undead and then killing them with the axe, particularly if you have access to Dead Thrall, so you can re-use the same corpse indefinitely. The kill count is supposed to reset every morning at 5am, and the first time you equip the axe after midnight; however, see the bugs section. 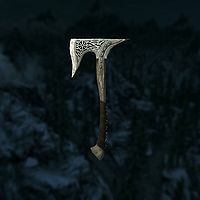 Smithing the Rune Axe will "lock in" the number of undead killed, and the count will no longer reset. ?